Another talk with Pam and another post. She made a comment that I really wish was correct - about me being good at knowing where to go when sailing upwind. My reaction was boy, I wish that was true. Many of the international people who I sail against have forgotten more than I will ever know, but this is usually competing in open-water conditions. Because we live in Dallas, I'm much more comfortable on lakes. 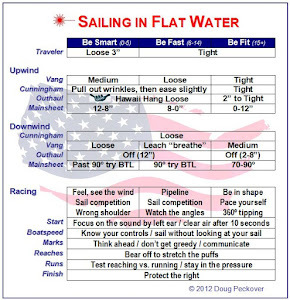 So with that in mind, here's everything I know about where to go when sailing upwind. Sailing the course - where's the weather mark? What's the fastest way to get there? The answer is usually on the tack that takes me most directly to the mark. Sailing the competition - what are they doing? If I want to go one way and they're going another, what should I do? Sailing the conditions - what's the wind doing? What pressure can I see on the water? What's my compass saying, knowing that it tells lies close to the weather mark? A middle-of-the-fleet sailor might interpret this to be "take the tack closest to the mark, watch the leaders, and tack on knocks." This actually works well ... if we have decent speed and want to stay in the middle of the fleet. And this is end of the post if we're happy with that result. But there are lots of things that we can do to improve this. And the best way to manage this is knowing when to tack. 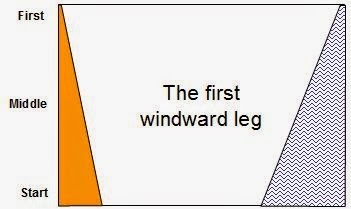 A windward leg is like a chess board tilted 45 degrees. What I find interesting is that a leg that is 1 mile long is also 1 mile wide, so 2 boats banging opposite corners will be up to 1 mile apart! And the conditions for these boats can be very different! 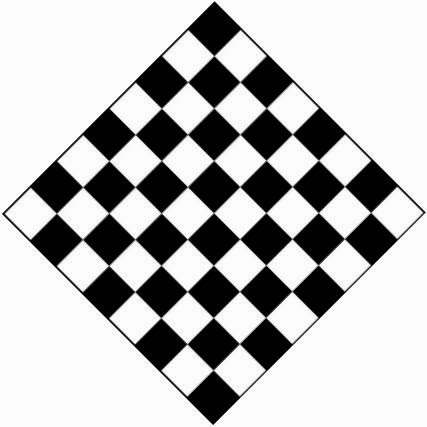 And just like in a game of chess, there are a near-infinite number of choices: bang a corner, play the middle left or right, watch for and try to protect the inside of the next shift, try connect the dots that we see on the water, cover the boat that we want to beat, wait for a Zen moment, etc. When I was talking with Pam, I kept saying things like "it depends" and "yes, but but keep and eye on such and such." The reason is because it's a combination of sailing the course, the competition, and the conditions. 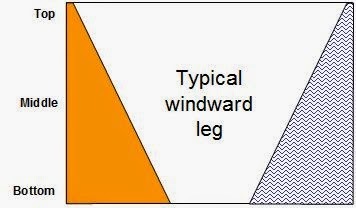 This is where it gets really interesting because the best combination changes as we move up the leg. It's a constant balancing act of where to sail, what are others doing, and what can we see. The bottom of the course has all three options and they're more or less equal. As we move up the course, where we can sail gets more and more limited. As we approach the windward mark, the course and conditions become irrelevant because we have no options other than heading for the mark, so sailing the competition is the most important option. If there is no obvious side favored, we go with the competition. If the left has more wind and starboard tack is closer to the mark, but the competition is going right, we go middle left but keep our eye on the right. If the course is square and the fleet splits evenly but there is more wind on the right, we go right but keep our eye on the left. The way we adjust these options is by tacking so we have to continuously decide between not tacking, tacking to head towards the other side of the course, or tacking twice to stay with someone who is giving us dirty air. Things change as we approach the top of the course as the competition converges to round the mark. It ends up being almost all tactical to keep our air clear as long as possible, to have right-of-way, deciding if it makes sense risking getting greedy at the mark, determining how crowded the layline is likely to be, remembering to get inside the last shift which is always persistent, etc. We have to focus less on the course and conditions as it becomes more and more important to focus on our competition. So, we now have a basic idea of the relative importance of the options determining when to tack. But as in all great plans, things fall apart when the battle begins, and being able to adjust the relative importance of the course, the competition, and the conditions will make us all better sailors. Here are 6 examples. I focused almost all of my attention on where my competition went and then covered them without interfering (as I leaned in Cape Town) so they could teach me. Beating these two world-class sailors was dependent entirely on watching for the little mistakes that everyone makes. For this reason, at world championships I often rely on others to decide when to tack and which side of the course to play. Another important factor is that world championships are held in open water where the wind tends to be steady, so the observed conditions are less important. 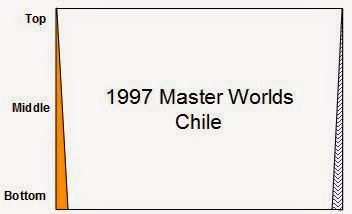 3 - When we're 100% sure we know what we're doing (very rare): You may never get to see as amazing an example like this: multiple Olympic and world champion Paul Foerster match-racing at the Pam Am Games which was sailed in J/22's. In very light conditions, Paul started right on top of his competition and was pulling away when the gun went off. In match racing, we only have to beat the one boat and there was no way this other boat could catch and pass such a skilled sailor. So, what did Paul do? He immediately tacked away, went hard right, and won the race by several minutes. Paul read something on the water or in the clouds that made him sure of the conditions so that the course and competition were not important. 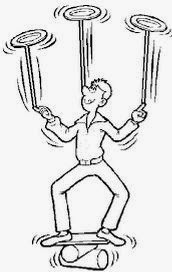 Very few people in the world have enough skill and confidence to do this. The longer I waited, the less important the closest competition was as the conditions and course options increased in importance and eventually outweighed the feelings of needing to cover. Thankfully, the-leader-must-know-what-he's-doing-mentality worked and the two right behind me tacked to follow. Had they continued going right, they could have found their own right shift or pressure and won the race. 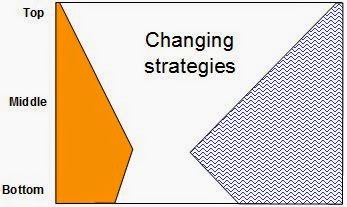 There are many other situations that can be shown with many similar diagrams, and these might be a useful tool for chalk talks after racing. The key is feeling how much relative importance to put on each of the course, the competition, and the conditions we see on the water. 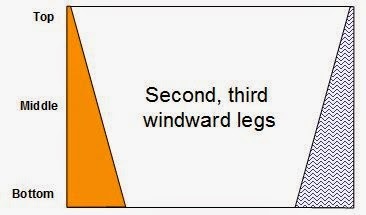 And knowing that in sailboat racing, these options change from race to race and even within the leg of a race. 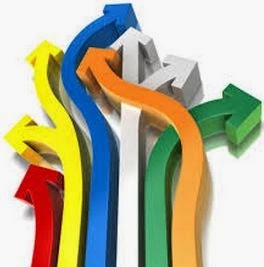 We have to constantly look around, assess what is happening, and be prepared to tack at any time. Excellent post Doug. As a lake sailor, do you put any priority on sailing toward the closest weather shore as is recommended in a lot of the sailing texts? If my competition heads towards a shore I'll probably go with them or at least protect that part of the course as I consider the conditions like steady winds (away from the shore), bending winds (closer to shore), and smaller waves (closest to shore). Perhaps I should do more reading! Perhaps I should do more thinking! For me, the trick is not so much thinking as it is being more aware of what's going on. As I tried to explain to Pam, "it depends" and "yes, but..." are all about knowing that there are always options, and the best sailors have developed a feeling about the shades of gray rather than the black and white. Gray is less risky and, for me, a lot more fun. Well said. I was coached by Brett Davis in Cabarete a few years ago and "it depends" was how most common answer to the questions we students were asking him. I think you are touching on the secret of excellence in so many fields - the virtuosos see and understand and know how to use all the shades of gray, whereas we dumb fat Laser sailors and six-fingered guitarists are still trying to see everything in black and white. I had trouble writing this post because it's all about gut feelings, and reducing it to words and a possible teaching aid was a challenge. This may also explain why some of the best sailors have trouble explaining why they did something on the racecourse. 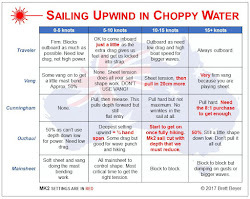 The graphics in this post were my way of (1) showing that there are many thing to consider, (2) they constantly change, and (3) there may be a way for a middle-of-the-fleet sailor to understand how to learn from the best of the best. Great article. 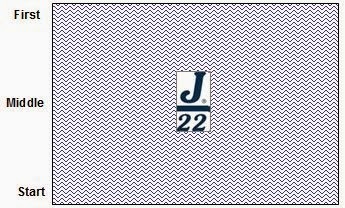 I sailed with Foerster as foredeck in J22 WC (I had never crewed before, so the fact that our boat won is proof of Foerster's greatness! ), and we had one bad start in a race. We were on port when there was an obvious big rightie. Foester asks me if we should tack, I yell "Tack!" Foerster asks pit if we should tack, and he yells "Tack!" Foester says "I don't want to tack right now." We go hard right, tack in a huge persistent shift, and win race by nearly a leg. I asked Foerster after the race what he saw, and his answer was "I don't know." He wasn't being a jerk, but it was obvious to him, so obvious he couldn't verbalize it. 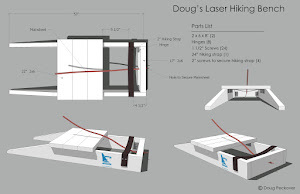 Getting back to Lasers after a medically enforced 13 year absence, I hope I can be more flexible as I race. I will keep referring to this article in the future. Thanks. 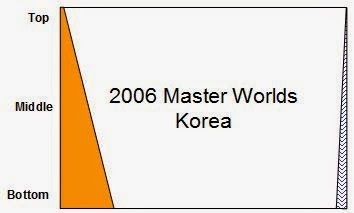 There was another example of this brilliance at the Oman Worlds. In race 5, Norwegian Olympic rep Kristian Ruth started the second beat in the mid-teens beside Robert. They had been sailing together for a while and were going the same speed. Then, Robert tacked away. They both tacked again about a minute later and Robert crossed 50 meters ahead. Robert went on to finish 2nd while Kristian held on to 15th. I asked Kristian what happened and he replied, "Robert saw something I did not." Robert went on to win the Oman Worlds. It's great to have you back in Lasers again.